In recent years my tackle I have changed immensely. Some time back my dad and I were using very old tackle that were on the brink of giving in and some of it was already way over its due date. Our tackle wasn’t what one would expect from two anglers that fish as much as we do. The past few years our tackle has been upgraded; some of it was through sponsorship’s that we are truly grateful for, while the rest was us putting down the cash to replace old overused. I appreciate the fact that I grew up using very modest tackle for most of my life and most of the time, this tackle did the job. Yet, I see with every trip, having the right tackle does make a difference. I spend almost every weekend on the water and my tackle get put through its paces as I spend many hours using it. One of the things that I have picked up when it comes to the difference between cheap tackle and more expensive tackle, is the life span of the tackle. Essentially, most tackle these days feel pretty good when you take it out of the box for the first time, but once you start actively using it, this is when you see the difference in quality. Soon enough the smooth casting reel suddenly starts to make a strange noise and doesn’t cast or reel in as smooth as it use to. In Afrikaans there is a saying “goedkoop koop, is duur koop” which means that buying cheap stuff leads to buying expenses stuff. This old saying is very true. If you as an angler plan to fish often, it is worthwhile to spend a bit more on your tackle to ensure that it lasts longer. There is another aspect to this conundrum and that is when you compromise on your tackle, you compromise on your results. Now, for social anglers, this is not such a big issue. It is not necessarily as important for you to capitalize on every single opportunity that comes your way – you can lose a fish every now and again, there is always another chance to catch one. The problem is, as soon as you make the decision to become as pro angler, you need to capitalize on every single opportunity that comes your way. Having the right tackle for the right circumstances means that you will be able to use your chances more effectively. There is a fine line between going overboard with your tackle and just having the right stuff to get the job done. This is something which I have only realized in recent years. Being a competitive Artlure angler taught me to have the right setup for every species, yet I only had two bass setups – one for cranking and one for plastics. At this stage I have moved over to a heavy cover jig/plastic setup, a cranking setup (with a cranking specific rod on its way), a jerkbait setup and a finesse plastic setup. Though, I must admit that I have been spending more time on bass than I use to and therefore I can justify acquiring technique-specific tackle (plus I managed to come across some very nice bargains lol). When purchasing tackle, I suggest that you spend some time thinking what you aim to achieve. If you are going to spend a lot of time on the water and losing a fish can result in you losing a comp, then you need to think twice before making a purchase. On the other hand, if you plan to fish socially, there isn’t really a reason to spend a huge amount of moola on having the best tackle (except if you want to impress other anglers with your fancy gear which is pretty lame). This issue impacts on every aspect on your gear. Whether looking at the rods and reel you use, or the hooks and other terminal tackle, even the gloves you use (if you use gloves) can have an impact on your fishing. I remember one time I fished a league with my dad at Roodekopjes. It was a cold morning, therefore i decided to wear the new pair of gloves I bought for myself. The gloves were made of the same material that diving suits are made of and they kept my hands warm during the cold morning as we pulled away and headed towards our first spot. We decided to fish submerged trees for with Texas-rigged creature baits. I remember pitching my bait against a stump and waiting for my bait to hit the bottom. I closely watched my line for any movement; next moment my line started dancing up and down – I tried to set the hook, but as I tried to set the hook, my hands slipped of the reel which resulted in the fish getting away. I saw the lunker swim past the boat, it was a good fish. My comfy gloves led to a poor grip on my reel, this led to hand slipping which resulted in a failed hook-set. A few casts later my dad landed a nice lunker and I ended up with a small bass which resulted in a very crappy result. This just goes to show how even something as simple as the wrong glove can impact on your results. If carp are tailing, but they are super skittish, using a casting rod to target them from a distance will lead to more success. On the other hand if the carp are feeding in rugged structure, it is better to use a carp dipping rod with enough back-bone and braid, to pull the carp out of the structure and prevent being wrapped. 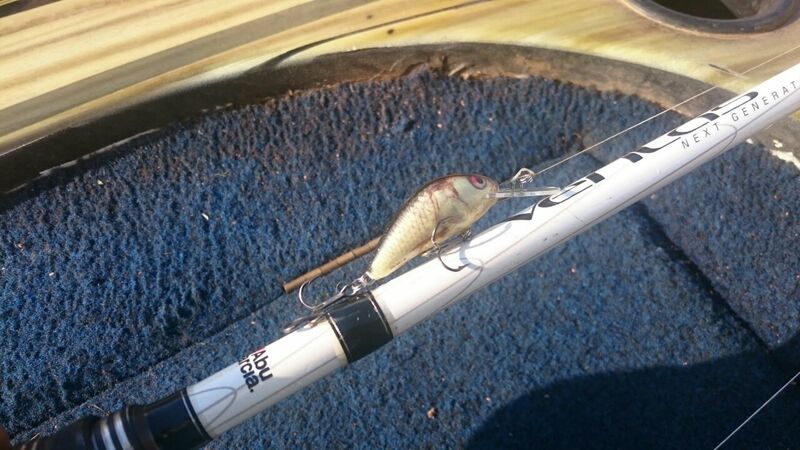 When working big jerkbaits, it helps a lot to use very light rod and reel combos, as you can hold out much longer with light gear when jerking your bait for hours in comparison to when using heavier gear. Using a very sensitive rod when targeting finicky yellowfish, papermouth or makriel can help to feel the takes when fishing is difficult. Using a thin diameter braid/mono/Nanofil when targeting species such as yellowfish or kurper makes a huge difference as you can cast light lures much further and you will be able to work it deeper which means more time in the strike zone. When you want to do some deep-water cranking, it is often essential that your lure makes as much as possible contact with the bottom. If you are spending the minimum time fish the the right depth, you will have minimal results. Test different cranks and see how many of them actually dives to the depth they are rated for – this is something which I have been doing a lot lately and it is intriguing to see the real results relative to the rated performance. These are only a few examples of where tackle has made a big difference for me. There are many more circumstances where the right tackle can make all the difference. Therefore, go out there, test your tackle. Find the gaps and see where you can eliminate these gaps from your fishing experiences. Essentially, if you want to be a pro angler, you need to try and create scenarios where you capitalize on every opportunity and if you fail to do so, it should not be because your tackle failed you, but rather just be a case of a bit of bad luck. Control what you have the power to control and take the rest as it comes. I hope this article has been of value for you. ← Ever heard of Nooitgedacht Dam? Another very good article thanks Rudolph! Pleasure Robert, glad you enjoyed it. One of those topics that one can easily write books about. Plesier Koos, hoop julle kry mooi vis. Ons gaan ook daar vang hierdie naweek en die naweek daarna.